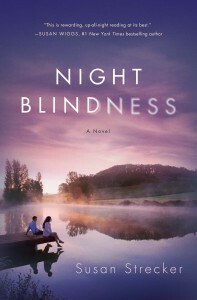 Q: Where did you get the idea to write NIGHT BLINDNESS?A: I started writing NIGHT BLINDNESS when my father was in the end stages of terminal cancer. Well, that’s not quite true. I wrote a version of NIGHT BLINDNESS when my dad was ill. It was my way of living through my grief. Many years later, I realized that the book I’d written was more of a memoir than a novel. So I started over and wrote this book. I kept the title because I loved it, but it’s completely different now. Q: Have you written anything else?A: Yes. My second novel, NOWHERE GIRL, will be released March 1st, 2016. The second draft of my third book is completed and I’m almost done with the second draft of my fourth book. I’m also researching my fifth book. Q: When you started writing, did you have the plot and the ending of the book laid out in your mind?A: I didn’t have any idea what was going to happen from one chapter to the next. In one scene, it’s revealed that two characters are dating. I had no idea those two even liked each other until I wrote it. I changed so many details (characters’ jobs, locations, backstories, etc.) that I couldn’t possibly have guessed the ending until I got there. Q: When do you write?A: I write wherever and whenever I can. I write in my car or in the shade under a tree while I’m at school waiting to pick up my kids. I’m not a good sleeper, so I’ll write in the middle of the night if I’m losing the battle those pesky sheep. My only rule is that if I have the time, I write. Even if I can’t think of anything to write about. Even if what I do manage to write is terrible. I write while I can and fix it later. Q: Where do you get your titles?A: Songs, songs, and more songs. The first version of NIGHT BLINDNESS had been completed for a couple of years before I heard David Gray’s amazing song, NIGHTBLINDNESS(Music Video), at a sporting event. I didn’t know the name of it, so wrote down a few lyrics and googled it when I got home. I knew it as soon as I saw the words that that is what my book would be called. My second novel, NOWHERE GIRL, was originally named SCAR TISSUE which is a Red Hot Chili Peppers song(Music Video). I heard it on the radio in my car and thought that it would be a great title for a book. So I created the entire novel around the name. I don’t recommend starting a book that way, but it turned out okay! However, NOWHERE GIRL seemed like a better fit, so I changed the title, but the book was borne from the Chili Peppers song. My third book’s title came from a Steve Miller song. I have songs by Dave Matthews and Peter Gabriel on my list of titles. Q: Is Jensen based on you?A: I wish! In my mind, Jensen looks just like Evangeline Lilly circa Lost. She’s also an incredibly talented pianist and artist. I, however, could be Jensen’s porky third cousin six times removed. I can’t even play chopsticks and my stick figures look like lines. However, we both have experienced great loss and great love in our lives. Q: Who are your favorite authors?A: Pat Conroy, Jodi Picoult, Jennifer Weiner, Pat Conroy, Patricia Cornwell, Wally Lamb, Joshilyn Jackson, Pat Conroy, Suzanne Kingsbury, Nelson DeMille and Elin Hilderbrand. Oh wait- did I mention Pat Conroy? Q: What’s your favorite book?A: The Prince of Tides by Pat Conroy. Q: What are you working on now?A: My third novel, tentatively named NIGHT FALLING, is in the final stages of editing and I’m working on the second draft of book four, which is, in part, about a girl who grew up in the racecar world. Q: Have you always wanted to be a writer?A: In second grade I wanted to be a teacher, a nurse and a vet. Then I realized I have zero patience (which took care of being a teacher) and I hated science (which ruled out the last two). It wasn’t that I always wanted to be a writer so much as writing has always been a good friend, a constant comfort. It’s gotten me through break ups, fights with friends and losing my dad. It wasn’t until after both my kids started school that I had more time to write and realized I wanted to make a go of being a novelist. Q: If you could meet any writer, who would it be?A: As you might have guessed from my answer to who are my favorite writers, it would be Pat Conroy. I promised myself long ago that if I ever do have the privilege of meeting him (or are merely in the same vicinity) I will lick him. Mr. Conroy- consider yourself warned! Q: Who is your favorite character in NIGHT BLINDNESS? Can you answer that or is it like asking who your favorite child is?A: I can answer that! I can also tell you who my favorite child is- just kidding! Okay- maybe I can tell you who my two favorite characters are. Sterling and Luke. Sterling is just so wise. Jensen wasn’t always the best daughter and he never loved her any less. He accepted her all those years she was running away from her family, and never gave up on her even though he knew she was different. And Luke, who doesn’t love Luke? He’s sweet, and cool, and hip. And spiritual. Nothing bothers him and he makes it better for everyone he loves.